Earlier this month members of the Yuna Farmers Improvement Group gathered for the hop-ortunity to collaborate their autumn pest management efforts. More than a dozen land managers attended the event, which was organised and funded by the Northern Biosecurity Group (NBG). 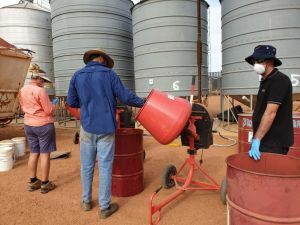 With support from a licensed pest management technician, the local farmers mixed nearly 2,000 kg of oats. 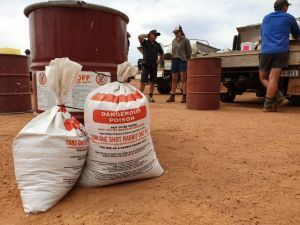 Three large red cement mixers were used to mix 375 km of rabbit bait and 200 kg of pig bait – with 400 ready-made fox baits also available. NBG Coordinator Marieke Jansen said ‘it was great to see so many landholders working together and recognising the benefits of a collaborated approach to pest management’. NACC staff also attended the baiting day to discuss our new Malleefowl Project – Gnow or Never: Supporting Communities to Save Malleefowl. This project provides local land managers with incentives for pest control, fencing and revegetation to support Malleefowl populations across the region. Malleefowl populations in WA have been negatively impacted by threats such as habitat loss, altered fire regimes and predation by exotic species such as foxes and overgrazing by introduced herbivores. NACC’s Bushcare Officer Jarna Kendle said new research by the Threatened Species Recovery Hub recognised rabbits as the number one pest threat to Australia’s threatened species. For more information about how you can be involved in protecting Malleefowl habitat in the Northern Agricultural Region please contact NACC’s Bushcare Officer Jarna Kendle on (E) [email protected] or (P) 9938 0108. Gnow or Never: Supporting Communities to Save Malleefowl is supported by NACC NRM, through funding from the Australian Government’s National Landcare Program.